I’ve had this incredibly cute hair from Pink Hustler sat in my inventory since I saw it in another blog (I wish I could remember which one so I could credit appropriately but I’m afraid it was months ago!) I was reminded of it as soon as I saw this adorable dress from BOOM at the Olive You fundraiser and couldn’t wait to put the two together. Olive You is full of brand new items from some amazing designers who are all giving 100% of the proceeds to help the owner of Olive raise some money towards court costs as her family fight to save their home, and it’s open until the end of the month. Shoes: ‘Halcyon Sandals (Orange)‘ – BOOM – L$275.. Skin: ‘Sora (Vanilla) Sugoi‘ – Pink Fuel – L$300..
I’ve waited to post about sian’s awesome items (more about these after the next pic) for this Japanese horror themed event because I wanted to be able to experience it fully for myself – and I’m so glad I have because it’s truly amazing! There is so much to see and do – I really took my time and spent a good few hours there (in sessions) but I still feel like I want to go back and do more. You land at the market area and from there you can pick up a HUD and instructions on how to play the game in which you follow and interact with an unfolding storyline.. a kind of puzzle adventure. The theme is horror but it’s creepy in parts rather than terrifying and I found the overall atmosphere interesting and endearing.. and the builds are beautifully done. It’s also completely free to play! I’m seriously impressed with all aspects – it’s just so fun and engaging and with the main puzzle, hunt & mini games within the game, there is lots to see and do! I’ve posted a collage of some of the pics I took as a teaser – but I’m giving no spoilers about the rest of the experience.. I hope you all have chance to find out for yourselves. Kagami will be available until the end of the month so there is still plenty of time. SLURL here or read more on the official website. As I mentioned earlier, the landing point is a market, and here you can shop for some truly original items designed especially for the event. sian very kindly sent me Chariot’s blog pack which contains a wealth of items based on the manga series Uzumaki.. I confess I haven’t read any of the manga, nor seen the film (though I now very much want to!) but the items are exceptional. I’ve always loved snails – there is just something about them that make me smile so, to me at least, the skullclamp, earrings and bracelet hit a sweet spot between creepy/sinister and cute (because ‘OMG there’s another snail.. squee!) – I appreciate you may feel somewhat differently if you don’t like snails but you still gotta appreciate the gorgeous textures and originality.. I particularly love the bracelets for the snail trails! For each main item you buy there are bonus snails – for decor and for your hand – and there is also a fatpack of all the ‘Spiral Obsession‘ items available at a very reasonable L$400. Seeing as I’ve been enthusiastic with my editing of the photo I’ve included a raw shot after the credits.. and a shot of the items displayed on a rather interesting mannequin head I picked up on the Marketplace. Hopefully they give you a little more detail, but I also recommend taking a look at sian’s flickr as the photos there are always incredibly beautiful and you’ll also be able to see the table in its full glory. 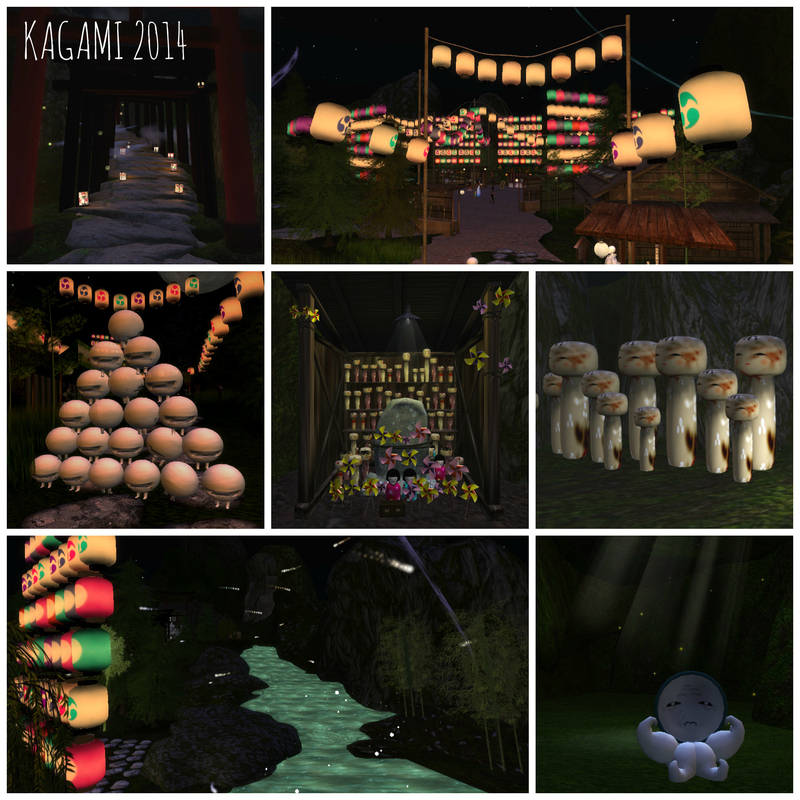 I hope you take the opportunity to visit Kagami while it’s there and show some love to the creators and participating designers if you’re able because without them our little world would be a whole lot less interesting! Snails: ‘Spiral Obsession – Hand Snail‘ – Chariot (@Kagami) – included with any main purchase.. 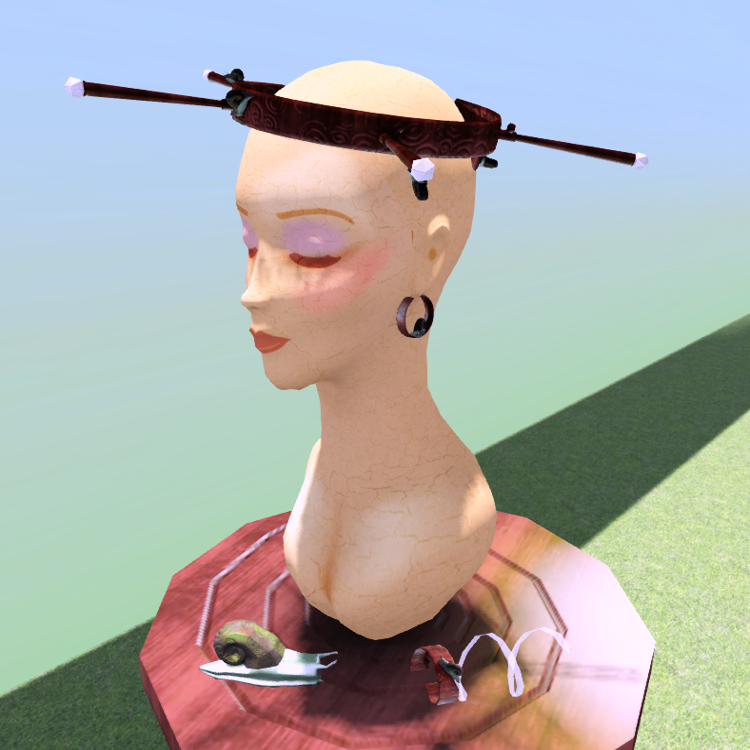 Skin: ‘Coral (Jamaica, Lotus C)‘ – Glam Affair – past Fifty Linden Friday, not currently available.. This is going to be a picture-heavy post but I couldn’t resist because the colours and surroundings were so beautiful. I finally made my way to the stunning Noble sim as featured on Cait’s blog and, I’m sure, many others. It is absolutely gorgeous and I need to go back to take many more photos! 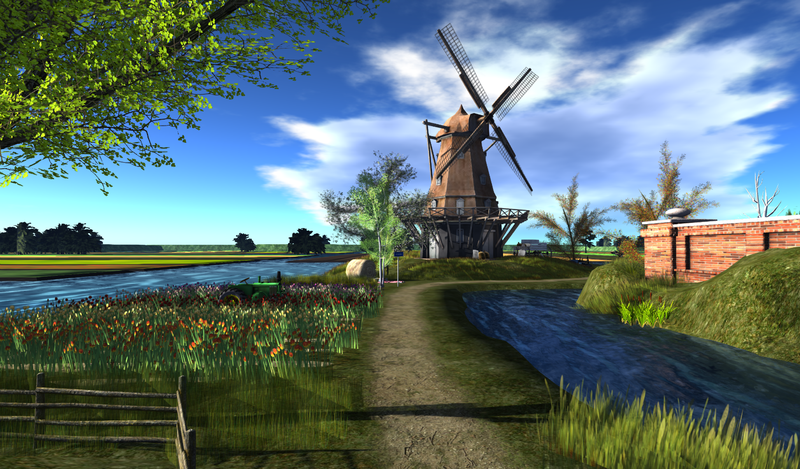 A nice touch is that if you join the group you may rez objects – a very useful thing for bloggers! The group costs L$150 to join but I think that’s a more than fair contribution to make towards such a lovely place. Several of the items I’m wearing are from The Gallery Gift Shop‘s anniversary event and hunt.. including this fabulous hat by Aniki and Mayhem Seetan of Azoury. It is so much fun to wear and the textures capture the light beautifully.. there are two colours available (black and gray) and both are for sale at The Gallery’s event for just L$79 each. 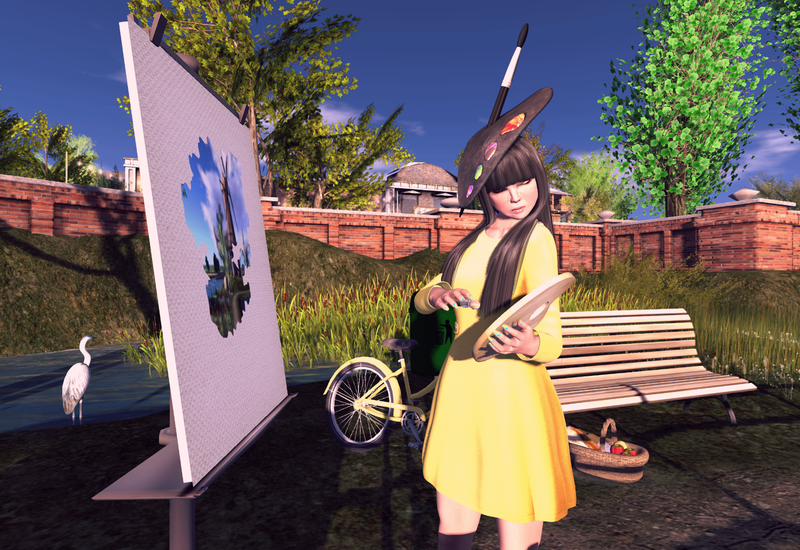 The amazing easel set is by Pandora Popstar of LISP – it includes various poses and let’s you ‘paint’ a picture over a certain amount of time (3, 9 & 15 minute options are included as are a wearable brush and palette). It’s really cool to watch the picture develop and, once completed, it gives you the image to place onto a canvas (also included). There are several pictures built in to the set but you also have the option of adding your own.. which is what I’ve done here. I’m going to stop chattering now and just post the rest of the pics.. full credits are at the end of the post! and the finished ‘painting’ – this is unedited except for cropping/resizing.. I may still tweak it further for my own canvas over at by Chiana Oh, though! Some of these events will be wrapping up soon so don’t delay too long if you’re planning on visiting. I mentioned in my last post that I was considering trying to fit more in during the week and this is my road test of that idea. I love spending time writing more detailed blog entries but they take so long to do that I can realistically only manage about one a week. I took a little look back at how frequently I used to post and it made me feel somewhat nostalgic – also, sometimes I just don’t have that much to say other than ‘ohmahgawdilovethischeckitout’ and I figure that would get ridiculously boring to read over and over again! So, I’ve decided to reintroduce some more standard, look of the day, posts that consist of a simple studio shot, a few words with any crucial information needed, and the usual list of credits (minus a few things like photo studio type stuff and windlights used). I may be playing with how I present these for a while until I settle on a look I’m happy with so please bear with me! I’m excited with the idea of hopefully being able to blog a little more often and perhaps keep up to date with a few time-sensitive events and offers. For example, this look was inspired by a store hunt being held by for the World Cup – there are 20 fabulous mesh items to be found inside footballs (I’m British, I refuse to call it ‘soccer’ 😛 ) dotted around the store (they’re pretty big so you don’t have to hunt too hard!) and each costs just L$15. 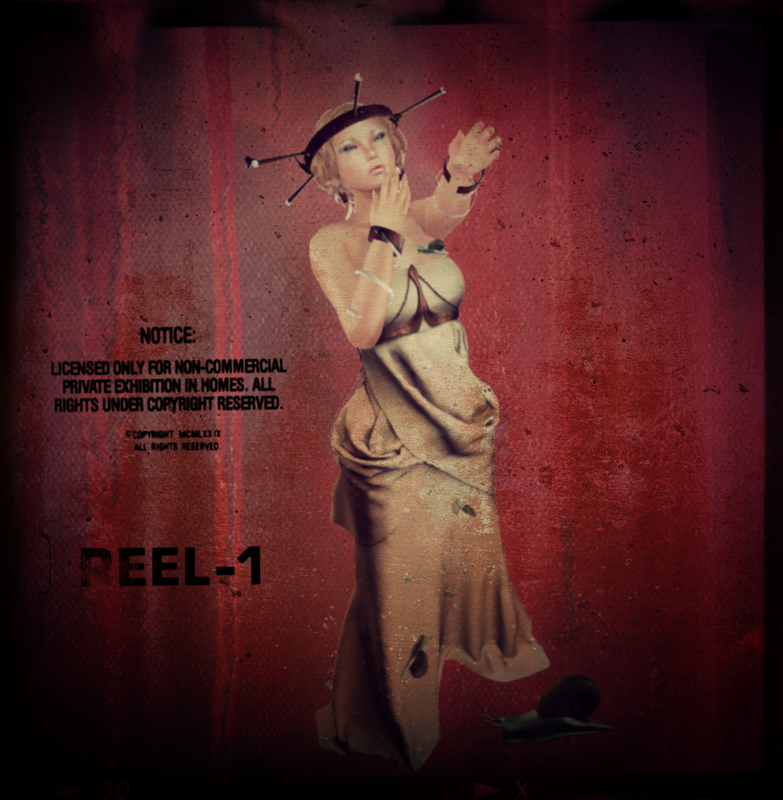 I’m not too sure when this hunt ends but can see more details on their Facebook page here and find the SLURL in the credits.